Hello and welcome to the 50th edition of 2DArtist! We hope you all enjoyed the January issue and are as excited as we are about this month’s issue. First up this month is an interview with the excellent concept artist Alex Broekel! We get a chance to look at some of the brilliant images that he has created and he tells us how his past work doing 3D environment lighting has helped him on the way to success. Also Alex tells us what it was like to work on a massive project like Harry Potter. I would say that is a pretty magical start to our February issue! Next up this month we take you into the fantasy world of Jeffrey Lai! Jeffrey talks us through putting our imagination down on paper, and shows us how important it is to let your mind wander when creating fantasy artwork. On the subject of fantasy, this month’s Project Overview comes from Jama Jurabaev, and he talks us through the making of his image The Beast! Jama shows us through his processes and has even kindly donated some custom brushes as a free download with this issue! Also in this issue we have an excellent image gallery bringing you work from Sergey Kolesov, Branko Bistrovic, Corrado Ficarelli and many more. We are very excited this month as we start a new and gripping series that has been done for us by the fantastically unique Dr. Chee Ming Wong. We start this series by setting the scene, as Chee talks us through the 5 ages of steampunk and in this issue we look at the Victorians! We hope you all enjoy this steampunk master class because we think it is great! We hope that you enjoyed the first instalment of our Painting Fantasy Medieval Scene’s tutorial, we continue this month with Jesse Van Dijk. We know how tricky it can be to get your scene started and decide on what you want to achieve, so Jesse explains how to tackle this issue, and creates an amazing city on stilts for our enjoyment. 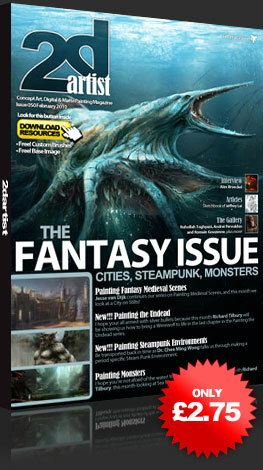 February’s issue also presents a monstrous double bill from our very own Richard Tilbury. Is that a full moon I see? Arm yourself with silver bullets as Richard talks us through bringing a Werewolf to life! Also this month Richard continues the creating monsters for environments and in this issue we dive into the deep blue and look at sea monsters, beware though it may put you off going for a swim!